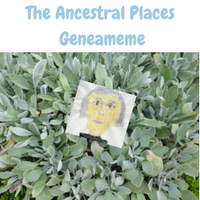 Thanks to my genimate, Alona, for coming up with the The Ancestral Places Geneameme Challenge. I'm late to the party but I've had a ball. It was so much fun that I might prepare one for Mr Geniaus'ancestors too. I have enjoyed this exercise immensely as it has forced me to focus on my direct ancestors instead of engaging in Tangential Genealogy. It has made me realise that while it's a good idea to search laterally and apply the FAN Principle it is vitally important to fully research and document the lives of our direct ancestors. It's a while since I have concentrated on these lads and lasses. Here comes a resolution - I am going to spend dedicated time over the next few months (in between travelling) looking at the records of each of my direct ancestors and adding to their stories. Sometimes we need to have a focus - thanks again Alona for forcing me to focus. There may be more announced but at the moment three of my geneablogging mates and myself have received invitations to be Ambassadors at Rootstech 2018. 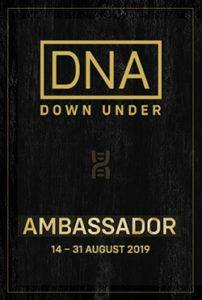 I am thrilled to be sharing the honour with Caitlin Gow from Brisbane, Jenny Joyce from Sydney and Sharn White from Sydney. We will be working in the Media Hub at Rootstech (or as I saw it described today The Bloggers' Moshpit) to send you updates on the activities from the conference in Salt Lake City. It was particularly pleasing to hear that Caitlin, a young genie who represents the future of our hobby/passion/obsession, is joining the ranks of the Ambassadors. STOP PRESS: 26/8/2017 -I have just heard that Jennie Fairs will be a remote Ambassador. Australia is well represented. We will also have the opportunity to interview some of the genies at Rootstech in the video studio. You can see some of my previous interviews here on my Youtube Channel. Each year I try to organise a casual dinner for those international visitors from the British Commonwealth prior to the Conference. I already have quite a view starters for this event which I propose to hold on the Monday of Rootstech week. Socialising is such an important part of Rootstech. 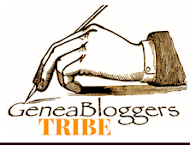 In this post from 2016 my Canadian genimate, Ruth Blair, says "There is nothing like sitting down and having a natter about our favourite topic – FAMILY HISTORY! " Rootstech provides many such opportunities. While you can watch some Rootstech sessions via their livestreaming program there is nothing like attending in person. How about giving yourself a treat and joining the Aussie contingent at Rootstech in Salt Lake City from February 28 to March 3, 2018. 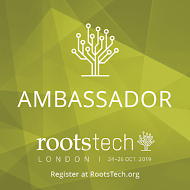 Disclaimer: As a Rootstech Ambassador I receive complimentary admission to the event, invitations to some exra events and dinners and a free registration to give to one of my readers. I bear the cost of my return airfares from Australia and pay for my accommodation and meals. British Case Study (Mark Gardner) – Tuesday, August 8th at 1:00PM, B-2 Lab. This webinar (and Your British Research Questions Answered) can fast-track your genealogical research knowledge and skills as few other learning venues and opportunities. This intensive collaborative class will teach you ways to solve difficult research scenarios by raising awareness for better steps to take that empower you to success, and which will clarify your thinking and provide some usable strategies for future research. Tracing Ancestry in English Census Records (Todd Knowles) – Thursday, August 17th at 1:00PM, B-2 Lab. This class illuminates many of the marvelous online sites which provide quick access to many of the available census records (1841-1911) and the advantages of some of those sites, over others. There’s so many excellent choices, so watch Todd as he navigates through and empowers you towards greater success along the your research trails using these outstanding records. Kissing Cousins or Not? Understanding Generations, Kith, Kin and Relationships (Craig Foster) – Tuesday, August 22nd at 1:00PM, B-2 Lab. This class explains differences between kith, kin, first and second cousins, as well as explains generations and why understanding this is so important. Genealogical Treasures at Findmypast.co.uk (Mark Gardner) – Thursday, August 24th at 1:00PM, B-2 Lab. This class addresses the rich English treasures and powerful databases this fast growing website has assembled which allows you some of the best chances for success in locating your England ancestry. Come and participate as Mark demos the myriad resources at your perusal. Your British/Irish Research Questions Answered (Phil Dunn) – Thursday, 31st at 1:00PM, B-2 Lab. Have a brickwall line you haven’t worked on in years? Bring it and any others to this webinar and watch us help you break it down into manageable steps—be it, England, Wales, Scotland, Ireland, or British subject abroad. 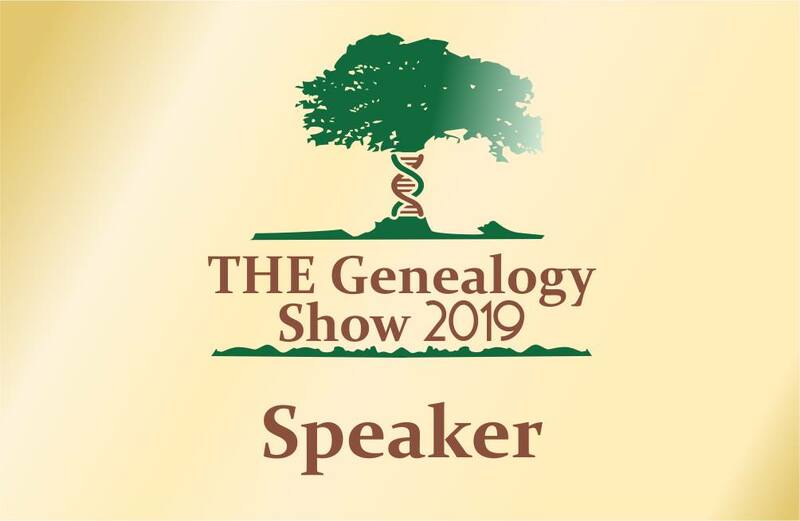 Feel free to take advantage of this opportunity to gain direct access to one of the Family History Library’s professional genealogists to obtain answers to your brick wall ancestral research problem. I was thrilled to be invited to the launch of National Family History Month at Chester Hill in Sydney yesterday afternoon. The eloquent Martyn Killion who was MC opened the event. Bryan asked if anyone in the audience had been overseas and returned to Australia between 1965 and 1972, my hand shot up. Bryan suggested I take a look at the records (which are organised in six month sets with cards within each set arranged alphabetically by surname) to see if I could find my record....and I did. Because they aren't indexed by name it takes a bit of effort to find the records but it's really quite easy. This snip only shows the top half of the card, the bottom section also contains my intended address. This is pure Geneagold. Imagine how many Australian Currys I will be able to find for my surname study there. The Keynote address by Dr Perry McIntyre was "Family History 30 years after Australian’s Bicentennial: who is looking now? In this thought provoking presentation Perry discussed the changes in the Australian population over the past thirty years and during her talk threw out challenges to family historians, archives and repositories and genealogy groups. She encouraged all to make their information and records accessible and appropriate to Australia's changing population. Martyn Killion also presented this year's Nick Vine Hall Awards for the best genealogy/family history society journals or newsletters in 2016 (not sure if I can name the winners yet). Our gracious hosts were the staff members of The National Archives of Australia who served us a delicious afternoon tea. While chatting with those in attendance I met two genies from The Lacemakers of Calais Group who live on my road and who had also made the trek to Chester Hill. It's a small world! 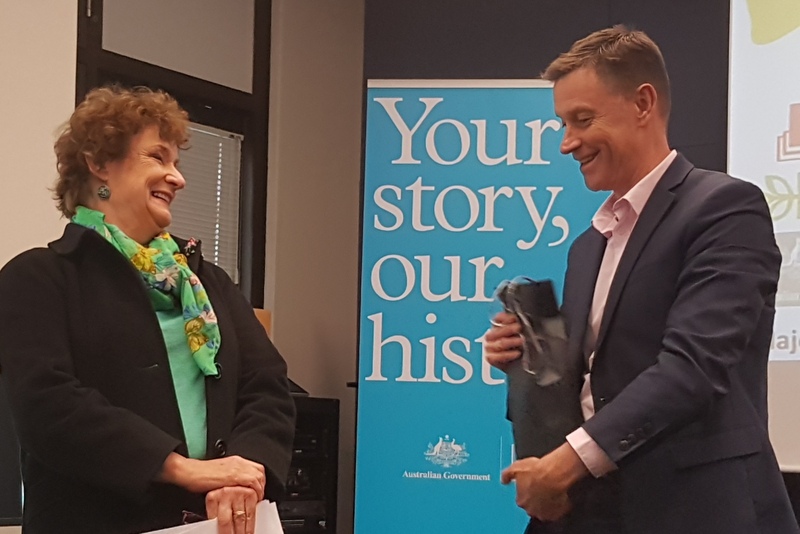 I also said g'day to people from The Society of Australian Genealogists and the Bankstown, Botany Bay, Ku-ring-gai and Nepean family history groups. Thanks to my genimate and National Family History Month Coordinator, Shauna Hicks, for my invitation to the event. I'm pleased I made that long drive.